The home where I grew up was across the alley from Bull Creek. Bull Creek was a very shallow and lazy creek, but no boats ever floated our section of the creek. Never one time in my life did I see a boat on Bull Creek. Even if someone had tried to float a boat on the creek, they wouldn’t have been able to float under the low bridge on Tahlequah Street. I often wondered when I was a child what it really meant when someone said, “When our ship comes in.” Oh, I knew it meant that they expected the ship to bring their fortune, to bring them money, but how or why, I didn’t know. Then in history classes I learned about the early settlers of America and how they depended on ships from England to bring them supplies, so I figured it out. 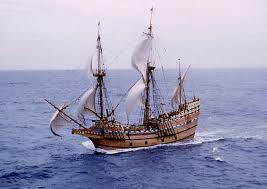 That’s what it meant when they said, “When our ship comes in.” The early-day settlers had to carefully watch what they used and use things from nature in their new home in America to make do until the next ship came from England with supplies from home. Mama would even make a joke about it. Our ship couldn’t make it up Bull Creek. The absurdity of that idea of an ocean vessel trying to come up Bull Creek would make us all laugh. Mama taught us all to work hard. We all had to work in the garden out behind our house. That garden was the biggest one on the block, and yielded the best green beans, corn, tomatoes, beets. Mama canned them all in Mason jars to feed us kids during the winter. She taught us to give to the church, to give to others who were in need, and help out our neighbors and friends when they needed a hand. Mama also taught us to believe in God to supply our needs and not some make-believe ship coming in. King David said, “I have been young, and now am old; Yet I have not seen the righteous forsaken, Nor his descendants begging bread.” Psalm 37:25.